1.3 miles away from London Heathrow, with quick access to all the hub's terminals, the Sheraton Skyline is so much more than just an airport hotel. 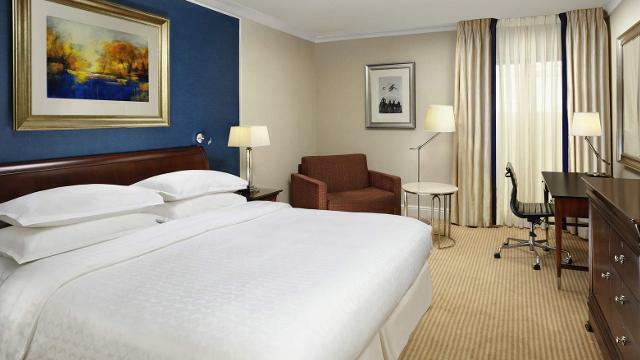 The 4* Deluxe hotel offers 350 of the largest and most comfortable bedrooms in the area of London Heathrow. You can also experience the tropical environment of a resort in the Sky Garden or indulge in its relaxing Pool. M4 - From M4 take junction 4. Follow slip road to Heathrow Terminals 1,2,3. Before tunnel turn left into Bath Road. Hotel is one mile further along on the left-hand side. Heathrow - 1 mile. Follow exit signs out of Heathrow, go through the tunnel, at roundabout take the third exit (concorde roundabout), up to the slope onto the A4, and the Sheraton Skyline Hotel is 500m on the left. Is Sheraton Skyline Hotel and Conference Centre your business?